What is art? What makes one piece of work art and another not? What makes a piece of art any good? Ask these questions to any group of people and you can expect a multitude of answers in response. Everyone has different opinions on art, as it is one of the most subjective topics out there – which is one of the reasons it is so hard to be considered a good artist. One person may think your work is amazing; the next may hate it. This makes sitting art exams particularly difficult, as well as having any sort of art-related career. I think that we are surrounded by a variety of art in different forms (everything from poster designs to architecture to fashion) and you don’t have to be an artist to use art in your career, but the most subjective form is traditional, expressive art, such as paintings and sculptures. I feel some of the key elements in art are creativity, skill and meaning, and after seeing more and more art throughout my life, I have developed strong opinions on each. While thinking about art, the first thing I realised was that creativity is important to make the work unique to the person who made it. I was told from a young age that art is a creative outlet, where you should express yourself and be unique, something I have always believed to be true. An artist should strive to create something original and new, but also personal to his or herself. This can be achieved using different subject matters or painting techniques and materials, in order for the artist to allow us to see the world in his way. It should be some sort of opening into his mind, which is something unique to everyone, and a good artist should express this in his own style in order to interest other people’s own minds. A piece of work can be very realistic and require a lot of skill, but if there is nothing exciting about it, then it is simply a dull piece of work. For example, one of the most common still life subjects is fruit, and many artists have painted incredibly realistic pictures of fruit, but to me, there is nothing interesting about fruit on its own. However, if the artist uses a creative style to paint the fruit, or comes up with a more unique way to use the fruit in his painting, then for me, it becomes a much better piece of work. Similarly, the composition and style of a piece can be very simple, but if the subject is something interesting, for example using places or creatures that come entirely from the artist’s imagination, or real objects that aren’t commonly used in paintings, then the work itself is more intriguing as well. I find that unusual artwork is always far more interesting. Over the years, I’ve seen plenty of modern art, which has made me question the skill of such artists. Modern art pieces are unusual and creative, but seem to require very little skill to produce. There is no true talent evident, and anyone could be an “artist” by producing pieces like these. For example, much of the work in London’s Tate Modern is very unique, but a lot of it could be produced by anybody, such as paintings that appear to me as splatters of paint. I think these paintings are bright and fun to look at, but I wouldn’t call them good art, because I feel anybody could reproduce them easily, so I wouldn’t pay money to see or buy them. Other pieces I don’t like are sculptures that don’t seem to resemble anything at all and are made of bits of junk or are just strange twisted shapes. Again, they are unique, but I don’t see any skill involved in a lot of them, and I certainly don’t see how pieces that students make like this earn degrees when people who are very talented at drawing don’t even get into art schools. Also, as well as not needing much skill, I think there are a lot of pieces that don’t require much imagination either, which are therefore not really art in my opinion. I think that art requires true talent, or anybody could be an artist, and some artists are trying to fool people into thinking they’re more talented than they really are, which is something that greatly annoys me. Another big issue that lies within opinions on art is the purpose of it. Design always has a clear purpose: for example, products are designed for use, fashion is designed to wear and graphics are designed to advertise. Expressive art, however, doesn’t have such a clear purpose, something I’ve noticed when asked to write about pieces for school work. The artist obviously uses it to express himself, but if he needs to sell his paintings commercially to make a living, then that must become its purpose. Some artists don’t mind altering their style to suit public demand, while others will always stay true to their own style, no matter what else. Others think art must carry some sort of meaning or message. Personally, I think art should be whatever the artist intended it to be. If he wishes to give the piece a meaning or story, then that should be his own choice, and if other people like his work and want to buy it, then that is a good thing, but not essential. No one can make a piece of art that suits everyone’s taste, but it will probably appeal to somebody. To me, expressive art doesn’t need a clear purpose in the way design does – it should be about expressing and enjoying oneself. Sometimes, I see meaning in pieces of art which can be quite intriguing, but there are other pieces that I don’t really understand, but I like anyway because of how they look. I’ve realised that meaning in art can be interesting, but I don’t think it is as important as creativity and skill, both of which I feel these pieces have. A few years ago I visited the Salvador Dali museum in Florida. A whole place dedicated to one man’s art, strange paintings of fantastical and impossible people, places and objects, yet all look incredibly realistic and told stories of his life and gave an insight to his mind. I found his work a little bizarre and creepy, but on the whole, fascinating and unique. It was unlike any other paintings I’d seen, and his skill was evident throughout every piece. His work is famous worldwide today, yet this man was expelled from the School of Fine Arts in Madrid shortly before his final exams. Salvador Dali has become one of my favourite artists, because I feel his work combines creativity and skill exceptionally well. Dali was part of the Surrealist movement, which was known for the way its artists painted real objects, but in an unreal style or composition, which made their paintings very unusual though slightly sinister. For example, Dali is most famous for his melting clocks – clocks are real, but they don’t melt in the way he painted them. He also transferred his ideas to sculptures, including a lobster telephone and soft clocks made of bronze and glass, which shows his range of skills. In my opinion, it takes great imagination to dream up these strange images, but he also painted them incredibly realistically and his paintings were very intricate and detailed. Not only does it take great talent to paint objects as realistically as Dali, but to paint them when he was mostly working from his own head (i.e. he wasn’t copying something or someone right in front of him) and maintain this standard of painting is really amazing to me. His work is unique and completely his own. I’ve found that another style of art I like is Impressionism, and the most famous Impressionist was Claude Monet (painting above is his). The Impressionist style of working was about capturing the general atmosphere and feeling of what they were painting (an “impression” of it), rather than focussing on all the details. 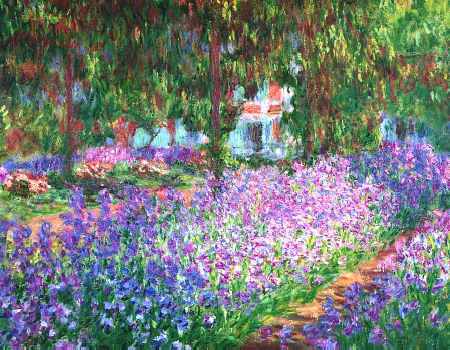 They were also the first artists to paint outdoors, so many paintings feature a lot of very beautiful nature in them. The Impressionist style is much looser and vaguer than Surrealism, but their paintings are full of life and colour, and usually had a happier, more tranquil feel than the Surrealism, which was quite sinister. One of my favourite parts of Impressionism is the way they capture one moment in time, by transferring the atmosphere to the canvas, rather than the exact look of what they’re painting. I feel this is much more effective, as the feelings of the moment will never be quite the same again, even if the object or place looks the same. Expression is the core of art, and this is what the Impressionists tried to do. Their style was creative though not altogether realistic, but still took a great deal of talent to produce. Impressionism and Surrealism are very different, but I like both of them, though for slightly different reasons. There are many different opinions on what art is and why we create things, and I understand this. Some people see meaning, creativity and skill in works that others don’t, and everyone has their own personal taste in the art they like and what they consider to be art – this can be seen in everything from people’s clothing choices to the design of their homes, as well as what sorts of paintings they like. I wouldn’t criticise someone for the style of art they like, as it is a personal choice, and I wouldn’t criticise an artist for simply expressing himself, however I do have my own taste in art as well. For me, a piece of good artwork has to combine creativity and imagination with some sort of real skill and talent, and this is something that I always try to achieve when doing my own artwork. Although I do art for my own enjoyment, I’m very critical of my own work, particularly when I feel it is lacking one of these elements. This combination of creativity and skill can result in a wide variety of styles, as seen by my own liking of both Surrealism and Impressionism, which are very different, but I like them both anyway. These are also the aspects of art I think should be taken into most consideration when grading someone’s artwork, although I understand that this will always be a very subjective area. But this is all just my personal opinion. Ah, the British masses, swarming overseas on their annual pilgrimage to pay homage to that god of the sky, the sun. Strange, really, that all year is spent complaining about the cold, wet British weather, and yet the one time of year the weather is considered “nice” is when the country’s population packs up and goes abroad, in search of more sun and heat than they can handle. See, I don’t understand this fascination with the sun. Sure, it’s nice now and then, but the same weather all year would bore me to tears. Where’s snowball fights and sledging when school’s shut for the day? Where’s the fear and excitement of thunder and lightning at your window? Where’s the fun of running and dancing – or better yet, kissing – in a torrential downpour of rain? Rain’s one of my favourites and very rarely do you hear me grumble on a wet day, unless I really don’t feel like getting soaked to the skin. Also, I’m not a particularly outdoorsy person (though I do like living in the country) and sunny days are an excellent-for-them but annoying-for-me excuse for my parents to moan at me to go outside more. Anyway, I think variety and the unpredictable make life so much more interesting. However, I must be in the minority from what I can gather. So, the masses flee the weather they are acclimatised to and then proceed to expose pale skin, untouched by the sun for the past 50 weeks or so, to this unfamiliar heat, thus resulting in that delightful shade, commonly known as “lobster red”. Well, apart from those vain women who insist on being unrealistically tanned all year round by basting themselves in fake colour, and come back from abroad just slightly more orange than when they left. Isn’t it weird how hundreds of years ago, women would plaster poisonous chemicals on their skin in an effort to keep it pale and white, and nowadays they seem to want to do the exact opposite, albeit without the toxic element? My skin tans better than most, and I’ll probably be resented by some based on this, and the fact that I’m really not bothered whether I tan or not. Thing is, it’s never even, I do sometimes burn in weird places first (tops of my legs this year!) and it fades within a few weeks anyway. And I’ve never touched fake tan, because I’d rather not walk around looking like and extra that’s escaped from the set of Charlie and the Chocolate Factory. It’s so obviously fake too, because when you live in Scotland it’s impossible to get enough sun to turn that colour naturally. Actually, I’d be off to the doctor if turned that colour naturally. Now, most of this sun exposure is done by following a careful method, the same one at least half of all holiday-makers use – arrive at hotel, lie out in the sun all day, every day for the duration of your stay, go home again. That’s all there is to it. People spend thousands of pounds to fly to foreign countries where they lay on beaches and at pool-sides next to hundreds of other Brits doing the same thing for two weeks. Some never even leave their hotels. No attempt made whatsoever to find out about the local culture or see some sights. Thousands of pounds for a bit of sun and an excuse to do nothing. Sure, relaxation is nice from time to time, but is it really worth spending that much on? Especially with the state of the economy right now. I’d want something more for my money than that. I can lie on a sofa and watch TV all day for a fraction of the cost. Personally, I find other cultures fascinating and always like to intersperse beach days with a bit of sightseeing. I know I’m not alone in this opinion, but it does seem like the majority of working class Brits prefer to live inside their own little bubble, completely oblivious to the new, exciting places around them. Then again, it could be the ancient “safety in numbers” principle rooted in their subconscious. See, you cannot help but feel like a bit of an intruder when surrounded by locals in their own homes and towns. At least holiday resorts are specifically for holiday-makers, which is possibly why so many flock to the same old haunts every year. “Tourist” is a word that has come to have a good few negative connotations, but that is what we must become in order to have any hope of seeing other parts of the world. More than once have I felt somewhat awkward and out of place while on holiday, but I’d still prefer that to staying in the same hotel the whole time. I want to travel the world, and if that means being seen as a British tourist, I guess I’ll just have to live with it. The other problem with tourism is “spoiling” the natural beauty or culture of an area. I understand why this frustrates people, as it is a shame to see beautiful places built up into apartments and hotels. This is why many people choose to stray from the beaten path, to places unvisited by thousands of tourists, and have a more unique holiday. It’s certainly a more effective way of finding out about other cultures. However, these holidays are now becoming more and more popular and travel agencies are promoting them further – so how long will it be before the unbeaten path is thoroughly travel worn? People want to see the unvisited and unspoiled – yet in doing so they make them visited, and it won’t be long before they, too, are spoiled. Ironic, isn’t it, how the best of intentions never quite work out how we want? My types of holiday are those that allow me a little time to relax, but see a lot of new places. They should be a learning experience. I want to travel the world and see famous sights – Eiffel Tower, Taj Mahal, Sydney Opera House, Empire State Building – but also maybe visit a few lesser-known places. I want a unique experience, but one that won’t spoil or interfere with places that ought to be left alone. Yes, holidays are there to be enjoyed, and everyone will have slightly different opinions on what they find fun – but really, how fun is lying around, doing nothing but burn for a week or two? Really? This is a bunch of my favourite quotes. Some are from books, TV shows or movies, others I just happened to come across at one point or another, and I know where some are from, but not all because I didn’t write down who said them. Some of them are inspirational or moving, a few are funny, and some are both. "You may not like him Minister, but you can't deny he's got style." "I like it here. You bring something broken and you fix it up." "When the rich wage war, it's the poor who die." "I believe that if it were left to artists to choose their own labels, most would choose none." "If you're holding out for universal popularity, I'm afraid you will be in this cabin for a very long time." "There are some things you can't share without ending up liking each other." "To the well-organised mind, death is but the next great adventure." "I still feel self-conscious that people will read this and think "Who are these idiots?"" "I never imagined myself being a writer. I always imagined myself actually being smart or something." "I've got a lot of dreams wrapped up in you." "Her love is like the wind. I can't see it but I can feel it." "I'm sick of following my dreams. I'm just going to ask them where they're going and hook up with them later." "You meet thousands of people and none of them really touch you. And then you meet one person and your life is changed forever." "Happiness can be found, even in the darkest of times, if only one remembers to turn on the light." This is the writing shown during the trailer for Harry Potter and the Deathly Hallows – Part 2. Some people may say it’s an exaggeration to call it this, but I definitely disagree. The first book was published in 1997, so the series has been around for fourteen years now, and is just as popular as ever. If selling over 450 million copies of the books, which have been translated into over 70 languages around the world, and the franchise being worth around £15 billion isn’t a phenomenon, then I don’t know what is. Now, the series will never truly end, as we can go back and revisit the stories and introduce them to new generations, but the release of this last film does mark the end of any more books or films being released. It’s a sad day for fans around the world, who have grown up loving Harry’s stories. Personally, these books were a huge part of my childhood. It seems fitting somehow, that the first book was read to me in Primary 1 and the final film is being released the summer after my last year at high school. So for me, this film also marks the end of my childhood. These books are the reason I got into reading, and made me love it so much – proof within the fact that I’m going to study English Literature at university next year. I’ve always preferred the books to the films because they have so much more detail in them, but I can’t deny that the films are spectacular themselves. I love the fact that they are entirely British, as that is of course, where the books are set. The cast is excellent, with big names like Dame Maggie Smith and Alan Rickman, alongside those who started as newcomers ten years ago but have grown into brilliant actors and are stars in their own right, particularly Daniel Radcliffe, Rupert Grint and Emma Watson. The sets and special effects are all excellent, really making you believe this world exists. I have issues here and there with changes that have been made from the books (I abhor that Harry/Hermione dancing scene in Deathly Hallows Part 1), but overall they are incredible cinematic works, and I don’t doubt for a second the last instalment will disappoint, if the trailer is anything to go by. J.K. Rowling’s story-telling however, should never be under appreciated. These stories contain everything I love in a good book. Action and adventure keep us on tenterhooks, while the magic takes us to another world, yet one that isn’t entirely different from our own. Her characters are ones that we love and are all well-written and even realistic – the twisted, evil Bellatrix and Voldemort have strong fan followings, as well as characters with smaller, yet vital roles, like Dobby and Neville. And despite the immense task he has been set, Harry is modest and humble, and still comes across as a teenager like any other in some respects, (e.g. his girl troubles) which makes us like him all the more. Her characters also develop and mature, which again makes them more realistic. The hardest part of it all ending is saying goodbye to these characters. The books are complex enough for adults and children alike, as the plot twists and turns, and things mentioned early on in the series that seem interesting but overall unimportant turn out to be massively significant (the Invisibility Cloak being just one example). The smaller details of the books are some of my favourite parts, in particular the humour scattered throughout, even in the darkest of times, as well as unusual spells or touching moments between friends or couples. Harry Potter has been a success the world over, breaking countless records, but what I find more important is the way it touches individual people. These stories are full of lessons about love, friendship and courage. Harry teaches us strength, Hermione that it is ok to be smart, Ron loyalty and that it is ok to make mistakes, Neville bravery, Snape love, Luna that uniqueness should be appreciated, Dobby the value of friendship, the Weasleys the value of family, Fred & George humour, Dumbledore kindness… and many more no doubt. J.K. Rowling encouraged children to read again and in the process she provided them with role models and life lessons that would help shape them as good people. People all over the world have stories about how these books have helped them through difficult times. These kinds of people are some of the most annoying in my opinion. I can’t stand it when people aren’t true to themselves in an effort to make others like them, but some cases are worse than others. Maybe a guy pretends to be interested in the same things as the girl he likes in an attempt to get to know her – I wouldn’t condone this method, but it’s understandable. Some people pretend to like the same things as everyone else, as they will be teased and bullied otherwise. Again, I wish they didn’t but I can totally see why they do. It’s the people who are hypocritical about it that really annoy me – they like obscure things to seem different and outside the mainstream, in attempt to look cool, which just proves that they secretly do care what people think. I also can’t stand those who have no individuality and always follow the crowd, but I’ll save that for another post. I’m not saying this is true of everyone who is a bit different or quirky, as some people really do like unusual things and don’t care what others think, and I actually respect these people a lot. It’s the pretenders that I can’t stand. It’s just so frustrating to watch them trying so hard to not fit in, and half the time they end up looking a bit stupid without realising. I feel like they are often trying to rebel or garner attention. I think that’s the root of my frustration at these people – the attention-seeking nature of how they act. To me, it seems like the most logical explanation for pretending to like something, or exaggerating your interest in it, and it really winds me up. Don’t get me wrong, I’m not against people getting attention – everyone likes to at some point – I just hate it when people go looking for it. I think blogs like this are a good example of this. Posting things online rather than keeping them private indicates that you would like someone else to read them, but I don’t like it when people desperately try to get you to read their blog, or follow them. If someone wants to follow a blog because they like it, that’s nice for the author, but that shouldn’t be why they publish it in the first place. I’m writing my thoughts for my own benefit mostly, and decided to post them in case others were interested (though I’m trying to keep my identity secret in case someone I know comes across this), but if they’re not, I don’t really mind. As for my own style, my music taste is mainly rock, which is a bit different from mainstream (I don’t hate chart music, I just don’t choose to buy or listen to it very much). My clothes are relatively normal, but not entirely in fashion. I think I’m on the fringes – not totally different, but not just another clone of the typical teenager. I don’t really like the idea of mainstream, but I wouldn’t dislike someone just because they did – unless they only liked something because everyone else did (as I mentioned above). It’s personal choice – everyone likes different things, and people should be true to who they are. I’m not going to say that I don’t care what people think of me at all (otherwise I wouldn’t be keeping this anonymous), because I think everyone does to a certain degree, but by and large, my interests and style are my own choice. Ok, I do have some guilty pleasures, and I don’t mention them very much to anyone, but I don’t go out of my way to deny them, as that would mean I was being someone I’m not. So, I suppose to sum up, I don’t like it when people pretend to like something they don’t for whatever reason – trying to fit in or trying not to – and I don’t like attention-seekers. I’m out with the mainstream crowd myself, but don’t advertise this blatantly to get attention, or try to deny it either in an attempt to fit in. I think being true to yourself is an important lesson in everyone’s lives, which some people will learn sooner than others (I’m still waiting for it to sink in for my sister). Yes, it irritates me when people aren’t, but I’m not going to lose sleep over it. I’m happy with who I am, which, I think, is the most important thing at my age. For the last 13 years I’ve known exactly what I’m doing nearly every day. Get up, go to school, come home, do homework, chill out, go to bed. Even the days without school were relatively predictable – a mix of more homework and more messing out. And if we go back even further, to before school, well, life back then couldn’t be simpler. Little kids have it easy, playing all day and letting someone else look after them and do all the worrying. I’m sure everyone has wished they could go back to being a child at one point or another. Childhood was routine, yes at times boring, but safe and (discounting the hell of exams and coursework) easy. There were some decisions in regards to the future, such as choice of subjects to sit exams in, but by and large, you knew what to expect each day. Then, all of a sudden the safety net is gone. You’ve been pushed off the pier into the wide ocean with no clue what you’re doing next. Yes, there comes a point in everyone’s life where your future is up to you. Well, hopefully. No doubt everyone will be weighing in with their opinions on what you should do – parents, teachers, friends, every other relative and the ones you never knew you had. But, the normal course that everyone follows – primary school, high school – is gone. Everyone branches off to do their own thing. It’s thrilling and liberating, but also absolutely terrifying. I don’t think anyone is fully prepared for leaving school until it actually happens. Having left school about a month ago (though I still had to go in for exams) I’ve got a whole boiling pot of emotions brewing away. There’s happiness at leaving the place that could be hell on earth at times and excitement about the future (I’m moving to a big city for the first time), but also sadness, as you know there will be people you may never see again and fear about the future (like I said, I’m moving to a big city for the first time!). No one can prepare you for this, so it really is a complete leap into the unknown. Some people will be more confident than others – not everyone will be leaving home, some have the next 5-10 years planned already. But for those who don’t fit into these categories, there is definitely something to be scared of. I can’t speak for those going straight into work or living at home while attending college, as I’m writing this based of my own feelings about leaving to go to university. The unknown is definitely the scariest part of growing up, in my opinion. Although my future has some degree of structure to it currently – I know what I’m doing for the next four years at least – nothing is cast in iron, and it certainly hasn’t always been that way. Sometimes I’ve felt jealous of the people who know, and have known for a long time, exactly how they want their life to pan out. I certainly could have done without the stress deciding on a future caused me. I knew I wanted to go to university, but I didn’t pick a course until about a month before the application was sent off, and didn’t finalise where I was going (I was accepted by a few places) until as late as I could possibly leave it. Part of the reason I put off the decision for so long was that I was scared I would regret it later, and I’m sure I’m not alone in feeling so uncertain about the future. In ten years I may still regret it, but for now, it feels right. But, by leaving my options open and taking my time deciding, it has made me somewhat more certain of my decision. I often wonder if those people who have a set career path from early on in life are more likely to have regrets later on. One of my hopes is that throughout my life I won’t have regrets. I want to make the most of life and enjoy it. And yet, despite the fact that my next four years are planned, for some people that isn’t enough. Both I and my parents, when telling someone what I’m studying at university, have then been asked frequently “With a view to?” I haven’t got a clue! It took me long enough to decide what I was doing and where I was going to uni, never mind afterwards. I don’t think it’s necessary to know what I’m going to do for the rest of my life now. I’m only seventeen, so I want to enjoy my youth while I can and not worry about years in advance. Having any degree opens up all sorts of career opportunities, so for now, my plan is just to wait and see where life takes me. Part of the reason I chose a generalised course was to keep future job options open, unlike courses such as medicine, which really only leads into being a doctor. Although my uncertainty about the future scares me, I want the freedom to choose and change my mind, like I always have done. And in this modern age, a job isn’t for life like it used to be. People do complete u-turns in their careers all the time, so if I do find myself doing something I hate, I’ll find something else to do instead. Planning ahead is fine, and I know I’d be a wreck if I didn’t know what I was doing in the immediate future, but I think there comes a point when you just have to wait and see what happens. Even if you think you have a ten year plan, it may not happen just as you expect. While the unknown of my future is definitely something that scares the crap out of me, some of the known parts do to – mostly, the fact that I’ll be living away from home for the first time. This doesn’t worry me quite as much as the unknown stuff, because I’ll only be a couple of hours from home and I can’t wait for the independence. No one asking what you’ve been doing, complaining about you sleeping in or the state of your room, having the freedom to come home when you want, go where you want, buy what you want (within a budget unfortunately)… Don’t get me wrong, I love my family and I know I’m going to miss them, but after almost four months of being home with my parents every day, and 6 weeks of my brother and sister when they’re on summer holidays, I think I’ll be ready to get away from them for a while. But there is still something a little scary about no one looking after you. Having to cook, clean, learn to budget and just be wholly responsible for yourself is quite a daunting prospect, and I’m sure that I’ll welcome a weekend at home from time to time. Again, this is purely from my own observations, but I think leaving home and school within a few months of each other has got to be more terrifying than leaving school but staying at home. There’s still a part of the safety net left. Leaving friends behind is less scary and more sad, because although people try to stay and touch, and many succeed, there will always be those who you perhaps weren’t all that close to at school, but suddenly miss more when they’re gone and you do lose touch. And yes, there are arguments that in this day and age, phones and the Internet make keeping in touch far easier, but I don’t think they can replace real life interactions (but I won’t dwell on this as it’s just struck me as a potential idea for another post). There is also the aspect of losing friends that makes me nervous, in that when I go to university I’ll know very few people there and have to make a bunch of new friends, and I’ve always been quite a shy person (though my confidence has definitely grown in recent years). Now, I know that most of this post has been about the fear of the future, in particular the unknown, but I am definitely very excited about it too. It’s a new chapter in the story of my life, one with freedom and adventure, new experiences to try, and for some, a chance to start over. I’ve been relatively lucky with my high school experience, but one of my bigger regrets is that my shyness limited my number of close friends and my social opportunities, i.e. I’m hoping to go to a hell of a lot more parties when I get to university! From what I’ve heard, uni is more than just a place of learning about your course (though that is important) – it’s about learning who you are, and enjoying your youth. It’s a step closer to the real world than school, but still isn’t quite there yet. My future isn’t mapped out and I’m terrified about next year – but I’ll muddle through, and hopefully have fun doing so!